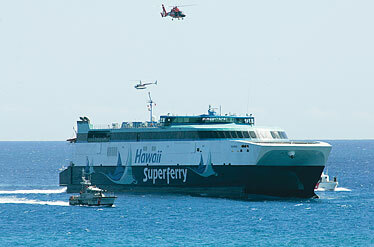 The Superferry has returned to sea after being dry-docked since Feb. 13 for an estimated three weeks of repair. The idled Hawaii Superferry returned from dry dock yesterday, but a company official says the repaired commuter vessel is still almost a month away from plying the seas. The company is accepting reservations for a planned restart April 23, said spokeswoman Lori Abe. She did not have further information about the repair schedule, and company officials did not return calls for comment. The Alakai slipped into its home port at Pier 19 at Honolulu Harbor yesterday after being dry-docked since Feb. 13 for an estimated three weeks of repair. In March the company extended the repairs to April 22 when they took longer than expected and the 350-foot catamaran sustained damaged in the dry-dock process. Coast Guard spokesman Lt. John Titchen said the company will begin its annual Coast Guard inspection today and finish with sea trials off Oahu on Monday. Inspectors will make administrative checks and review the crew's emergency procedures. Titchen said the company had scheduled the inspection for the end of the dry-docking period. The company has not told the Coast Guard when it plans to restart service, but it is not required to give the Coast Guard advance notice, Titchen said. He said the security zone, a 100-yard buffer area around the ship that is off limits, will remain in effect when the ship resumes sailing. In February, Hawaii Superferry moved up its mandatory annual dry dock from May to February to take advantage of the off-peak travel season, company officials said. The company resumed service to Maui Dec. 13 after a court ordered the shutdown of the fledgling service in August because of environmental concerns. The company halted service to Kauai the same month because of protesters in Nawiliwili Harbor.